I have a 7,0 cheetah ,then my next step up is a 8.5 cheetah . is there anyone out there using this sail ,can they comment . in the middle .hoping this will fill the gap.as a cammed sail it should match the power of a 7,8.no cam . i sail lions at 95kg. So suppose what goal is. Do you find cheta drop from 8.5 to7 too much?? 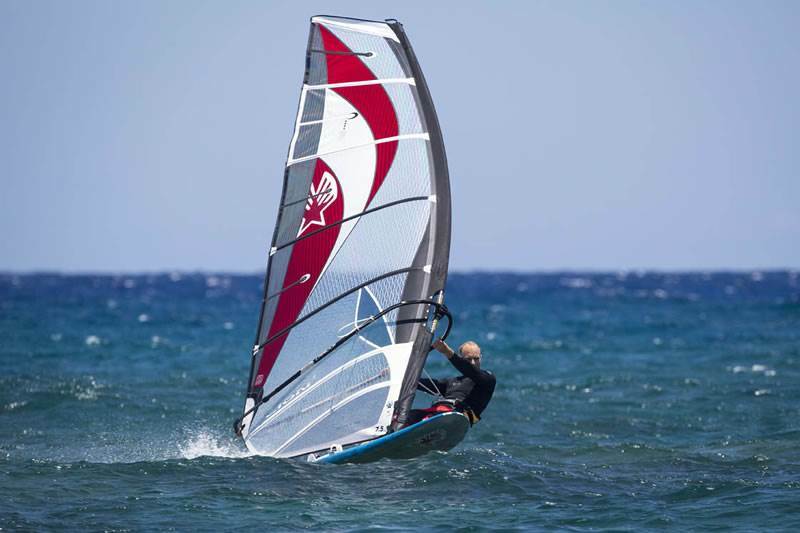 I don't think I could bare to sell my 7.0 cheetah ...it's my ocean sail .which is very easy to use in rough conditions . You right I probably don't need a in between . but want a fast flat water sail that I can sail fully over powered without going too big ,but don't want to go a full cammed sail ,or a huge luff pocket ....well,I would but EZZY don't make them .I did ask David about what sail to use for GPS .sailing . He suggested the lion .as it is his fastest sail. can you have too many sails ?? how is the Top speed of your lions Jeff. .? thats what Im really after top speed . Thanks joe , just having brought a ezzy 91% mast feel I should stick with EZZY. but the V8 has always been a good sail .had one years back . hi tardy i own 9 ezzy sails 9.5 lion 3 and 8.5,7.5 and 6.5 2014 lions ,i think you can do away with a 7 .5 as your sail spread is good if you really want to gps i find the 6.5 is fastest in 20 + knts . the 7.5 and 8.5 seem to keep up with the high end sails so the advantage of having small sleeve is great for water starting for me ,and handling and cam rotations are the best i have used.you don,t say what size mast you use as a 8.5 uses a 490 and the 7 uses a 460, ezzy really do work best with the correct mast and one of your sails has the wrong mast in it,unless you have two masts. if you buy a 7.5 lion you will need a 460 .
can't comment on the ezzys as I am using Tushingham sails at present, but for the sail size I think what you have is not bad. A few years ago I reduced my quiver of sails to a 7.5 and 6.0, and 5.2. It was probably more of a mind game that I played on my self that the gap of 7.5-6 was to big. However I did not really ever have any issues with this. When the 7.5 got to much, the 6.0 was perfect on my next board size down. would constantly find myself going to the beach with 2 boards and 2 sails pretty much most days(7.5+6m both no cam sails and 122ltr + 104 ltr board) and never having any issues). Talked my self into changing to 7.8m and 7.0m 2cam sails, then down to 6.2 and 5.2m. Now, the last season or so I find that I use my 7.0 mostly. if I cant get going with a 7m 2cam and I change up to the 7.8, I still can't get going. I constantly wish that I had an 8.5m sail. Going the other way, If I rig my 7.8 and get over powered then going to the 7, I am still over powered. I'll change to a 6.2, some times the 5.2. So if you think that a 7.5m cam sail is going to fit in your quiver only for certain locations or water conditions the go for it. Otherwise you'll probably find that what you have is hard to beat. Also, I have looked at the ezzy sails a lot and quite a few crew at my local use them and I think they are a really nice rig. Made to last unlike most sails today. Those that use them vouch for there good wind range. yeah I have a 490 for my 8,5. It a 100% north SDM .it works perfect ..and such a pleasure to use . And a 91%460 ezzy . great you like your lions . it doesn't really sound like I need this sail ...true ..
i accidentally brought it yesterday . it just looked too good .in orange . I'll give my report . kid brought the flu home so guess who's got it now .might be a week ..
i'd rather put a 7.5 on .which i haven't owed in the past ,as the 115 rocket is a very fast board compared to the 125 . I think it will be a great sail,and size to have . thanks grich. i have a RDM EZZY 91% 460.so all good. my raceboard specific sail is the true beast -9.5 severne. It's more powerfull than the 9.5 lion however for me as a 'keen beginner' it gets more unmanageable quicker in higher winds especially as I don't have the extras like adjustable out and down hauls. Hey olskool .i wouldn't be selling that 8.0 if I was you .real handy size . if your long boarding a 9.5 lion or cheetah would be a great light winder for your weight . 2 cam would probably give you more down wind power .i really can't complain about the low end poke of my 8.5 cheetah ....down the track I will buy a 9.5 .i will buy a cheetah though .because I will use it on short boards ,and they are mighty big sails ...I had a north 2001 9.6 warp ..which died ...it was one heavy mother ...when wet ..but it felt like you where planning in no wind ....thank goodness ezzy make a light 8.5 & 9,5 now . Maybe some would have 4 .mast in there collection for those who have been sailing a long time .or more. its a matter of having too.to get the best performance out of your sails. i also own a 9.4 2017 NP V8. Amazing fit and finish. Sailed it 2 times on a Super Lightwind board. It delivers more direct power than the Lion3, probably due to the fact it is monofilm construction mainly. Seems to be a great sail also. Back to the Lion3: if I could I would buy a 7.0 Lion3 if it existed, but it doesn't. There's nothing to regret about the Lion3. Great looking, bulletproof construction, easy to rig and tuneup. Finally, it is easy to waterstart with its narrow mast sleeve that won't pick up tones of water - a plus! (The NP V8 has a larger mast sleeve). nice one french toast .i like the ghost effect on vid one. Thanks Tardy. I'm not an "expert" sailor but speed on the water is my medicine. I know how to rig and trim my 8.5 Lion3 to my liking and it is an outstanding fast engine. I got it to plane my 124L in 12-13 knots and was able to handle it in gusts that were around 17-18 knots without felling overpowered. I used to sail a Gaastra Savage of the same size and it had more instant pull than the Ezzy but it also was harder to keep up with. A lot more physical and "raw". The Ezzy is more civilized while keeping its promise on the low or topend performance. It just does it in a smooth and more predictable way which works for me. Until then 8m Cheetah reigns supreme. Welcome to the two cam club .that should increase your light wind planning days . pity you have to wait so long ,I got the last 7.5 .so I was lucky .i got the orange one....untested yet . I picked up the last Ezzy Lion3 9.5 m2 sail in WA about a month ago but alas have not used it yet. I have always wanted one of these and I got the White. It tops off my Goya Mark 8.5, 7.8, 7.2, 6.6 and 6.2. I have used the 7.2 and 8.5 m2 Goya Mark mainly but I now have the Ezzy Lion 3 9.5 m2 also for my race board Mistral 1988 Equipe LCS XR and also for my Exocet RS6 Slalom.I have not been out in the last few weeks so can't wait to use it. In my past experience Ezzy sails are fantastic and well made. The Lion3 was developed by Ezzy with Kevin Pritchard so you know it means business. I have all the Ezzy RDM masts which are dependable and work on all the Goya sails as well. RichardG lucky! It appears that was the last 9.5 in Oz. Im waiting for new shipment to arrive. 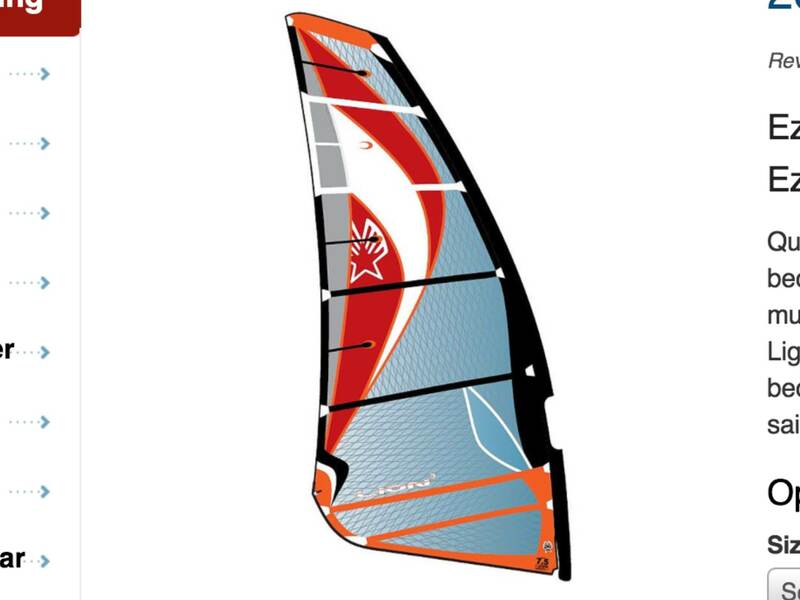 Cant wait to try it on my Speed F1 raceboard.Not much wind here in SE QLD atm.Makes the wait a bit easier. Oh well, back to fishing while the fan ISNT on. 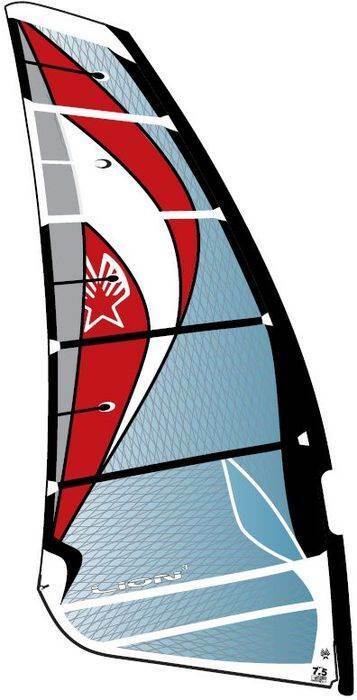 Is it just me or is this one of the ugliest sails to come out of a production loft for some time? Stu, i kinda agree. Id like to see better colours. But im no pretty boy either. For me its about Power, tuneability n many years use. Looks rank down the list. are you saying we have ugly sails. It was the last one I would have preferred the green one or the orange one instead. I don't think it is ugly. Tardy, theyre not ugly. Theyre UNIQUE. Yep a bit different. Yep suits me fine... Quick to rig, great to use..Different is how i roll. Im no muppet.